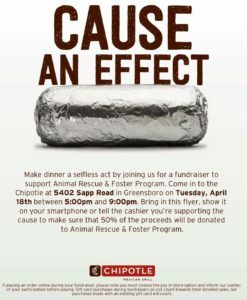 Dining Out for the Rescue at Chipotle! Are you ready for a night of no cooking? How about a night of no dishes? Join ARFP and Chipotle for a yummy dinner out! Visit the Chipotle at 5402 Sapp Road (Greensboro) between 5 and 9pm on Tuesday, April 18th. Show the flyer above to the cashier, and ARFP will receive 50% of the proceeds! Please ask your friends and family to join you. See you tomorrow night!